Barnes & Noble's new Nook e-reader is the e-reader that competitors must now beat. So long Kindle 2, it was nice knowing you, but a better reader has come along. And just in time for the holidays, too. If Amazon doesn't have a new model up its sleeve, it will be a Merry Christmas at B&N and a sack of coal for Amazon. 1. 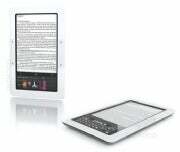 Better Hardware: The Nook starts with specifications that closely match the Kindle 2, including the $259 price. Exclusive Nook hardware features include a Micro SD slot, supplementing the 2GB built-in memory and Wi-Fi to supplement AT&T 3G connectivity. (Kindle uses Sprint, lacks Wi-Fi). While standby battery life is shorter than the Kindle (10 days vs. 14 days), the Nook battery is removable and replaceable--the Kindle's is not. 2. Color Display: Below the main 6-inch "reader display" is a 3.5-inch multi-touch color display, used for control and navigation. (Replacing the Kindle's keyboard). 3. More Books: B&N offers more titles than Amazon, plus the Nook can access 500,000 public domain titles from Google that are not available to Kindle users. The Nook will load and read Adobe Acrobat PDF documents, which the Kindle does not do. 4. Loan-able e-Books: Nook users can loan their e-books for 14 days at a time to other Nook owners as well as iPhone, iPod touch, BlackBerry, and PC devices (Mac and Windows) running free B&N reader software. 5. Storefronts: Potential customers can try out a Nook at their local B&N store, making it easier for the undecided to make a purchase decision. The stores will also offer special Nook content, including the ability to read entire books in-store for free. 6. Android: (Bonus reason) The Nook is an Android device. I am not sure that matters today, except for "cool factor" but it may be important in the future. The Nook is the first e-reader I've had any interest in purchasing. As soon as it arrives at the B&N over at the mall, I may just give-in.